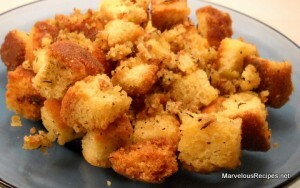 Cornbread stuffing is an excellent side with a variety of main dish meats. Try it with chicken, turkey or pork. 1. In a 10 inch skillet over medium heat, melt butter. Add celery and onion and cook until crisp tender, about 2 minutes. Remove from heat. 3. Cover with aluminum foil and bake at 350 degrees F for 30 minutes. Uncover and bake 15 minutes longer or until top is lightly browned. Makes 8-10 servings. *Mixture can also be used to stuff a 12 pound turkey.